Onychomycosis or nail fungus is a common complication of athlete’s foot. Both conditions are caused by dermatophytes, a type of fungi that develop in warm, moist areas and live on dead skin cells. Ringworm, as well as ringworm of the groin, is also caused by these fungi. Onychomycosis is a nail infection, whereas athlete’s foot is an infection of the skin. Over one-third of athlete’s foot sufferers develop toenail fungus as the infection can spread if not treated immediately. Both toenail fungus and athlete’s foot are contagious. They can easily spread in public places like gyms, swimming pools, locker rooms, nail salons, and communal showers. The risk of getting these conditions also increases with a weakened immune system, excessive sweating, minor skin or nail injury, and wearing confined shoes for extended periods of time. Good hygiene and proper skin care can prevent toenail fungus and athlete’s foot. In most cases, these conditions can be treated effectively with natural remedies. Here are the best ways to get rid of athlete’s foot and toenail fungus naturally. If you experience severe pain or the infection is spreading further, visit a professional. Apple cider vinegar contains acidic properties that can help in killing the fungus present in your toenails and skin. It can also lower the level of alkaline to stop the infection from spreading to other areas of your skin. This treatment assists in removing excess moisture from your feet to accelerate the healing process. To use apple cider vinegar, mix one part of it with three parts of warm water in a foot basin. 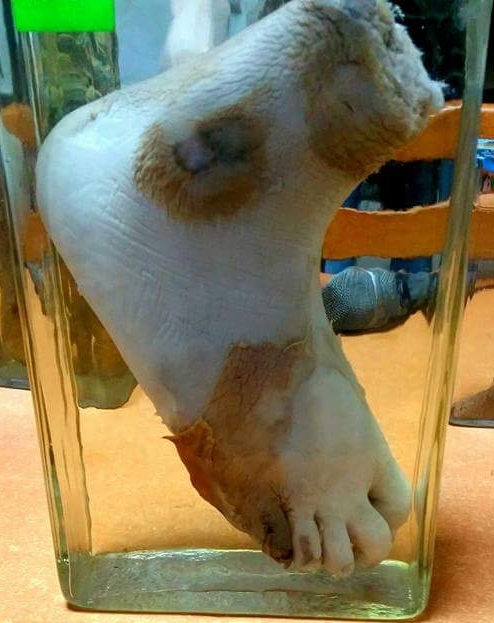 Soak your feet in this solution for fifteen minutes and dry thoroughly. Follow this remedy twice daily. Another option is to mix equal amounts of apple cider vinegar and water. Dip a cotton ball in the solution and apply it to the infected nail and skin. Let it sit for at least twenty minutes before rinsing off the area. Yogurt has active bacterial cultures that can combat fungal infections like toenail fungus and athlete’s foot. For best results, use plain yogurt as sweetened ones have less active cultures and may contribute to a favorable environment for fungi. To use yogurt, simply apply enough unsweetened yogurt to the affected skin and nails. Let it dry on its own before rinsing it off with warm water. Dry the area thoroughly. Repeat this treatment twice daily until you successfully get rid of the infection. Tea tree oil contains anti-fungal properties and it a powerful antiseptic. It can inhibit the infection from spreading and help in killing the fungus. To use, mix equal parts of tea tree oil with coconut or olive oil. Apply the solution on the infected areas using a cotton ball. Follow this treatment twice daily to prevent the infection from spreading. Another option is to mix one part of aloe vera gel with three parts of tea tree oil. Apply this to the affected area twice daily. Baking soda can also be used for treating toenail fungus and athlete’s foot. It neutralizes the pH level of the skin and eliminates excess moisture in the feet. You can mix baking soda with borax, a naturally occurring mineral that is also an effective anti-fungal remedy. Add enough water to make a paste and rub the mixture onto the affected areas. Follow this treatment twice daily. If borax is not available, baking soda mixed with enough water will also work. Apply the paste between the toes or infected nail. Leave it on for a few minutes before washing with warm water thoroughly. You can also sprinkle some baking soda into your socks and shoes to prevent the recurrence of fungal infection. You might think that Listerine sounds like a strange way to eliminate athlete’s foot and toenail fungus, but it works. It contains many disinfecting compounds, such as eucalyptol, thymol and salicylate. Eucalyptol has antimicrobial properties, thymol is a powerful fungicide, and salicylate helps in shedding dead skin cells. To use this treatment, fill a foot basin with equal amounts of water and Listerine mouthwash. Soak your foot for 20 to 30 minutes and remove dead skin cells by scrubbing with a soft brush. Wash it off and dry the area completely. Repeat this treatment once or twice a day. The ajoene compound in garlic acts as a natural antibacterial and anti-fungal agent. Including one or two cloves in your diet can accelerate the healing process of any fungal infection including toenail fungus and athlete’s foot. Make a paste by crushing one or two garlic cloves and mix it with three drops of olive oil. Apply this mixture on the infected areas. Let it sit for thirty minutes before rinsing it off with water. Follow this remedy once daily to clear the infection. Oregano oil is a powerful natural antifungal, making it effective in treating athlete’s foot and onychomycosis. This oil also contains antibacterial, antiviral and anti-inflammatory properties. Another great thing about oregano oil is that the Candida yeast does not develop resistance, while other antifungal treatments may lose efficacy over time. Mix a few drops of oregano oil with olive oil. Apply this mixture to the affected areas and let it sit for thirty minutes. Wash it off with water and dry your feet thoroughly. Follow this treatment twice daily for best results. Lavender oil also contains antifungal agents that can help in getting rid of toenail fungus and athlete’s foot. It can be combined with myrrh oil or tea tree oil. To use, mix 10 drops of lavender oil essential oil and 10 drops of either myrrh oil or tea tree oil in a cup of any carrier lotion. You may use aloe vera juice, witch hazel, or any unscented and non-greasy lotion. Apply this treatment three times daily to the affected areas. Another option is to add ten drops of lavender essential oil to a foot basin filled with warm water. You can also add seven drips of tea tree oil or myrrh oil. Soak your affected foot in the solution for 20 minutes. These natural remedies will control and accelerate the healing process of toenail fungus and athlete’s foot. Because these conditions require patience and persistence, use these treatments for at least one or two months to successfully clear the infection. Amanda Roberts is a professional blogger and a podiatry student. She is an enthusiast who loves to write on several niches, particularly in foot health, including plantar fasciitis, toenail fungus, foot massage and reflexology. Read more about her blog posts on foot health at Feet Remedies.